We start into chapter 11 today, that’s a good thing. Also it’s a week and a half to phoenix comicon. I still have a lot to do and work on to prep for this show and the one after it. I’ll be posting info and new prints on mondays update, including where we will be. Thanks for everything and the positive feedback, I sure needed it. Anyways, I’ll be in and out for a bit. Just remember to keep creating…. Great page! Is that a picture of "the two towers" hanging above his desk? oooh, alphabet! does it actually mean something, or is it just page-filler? 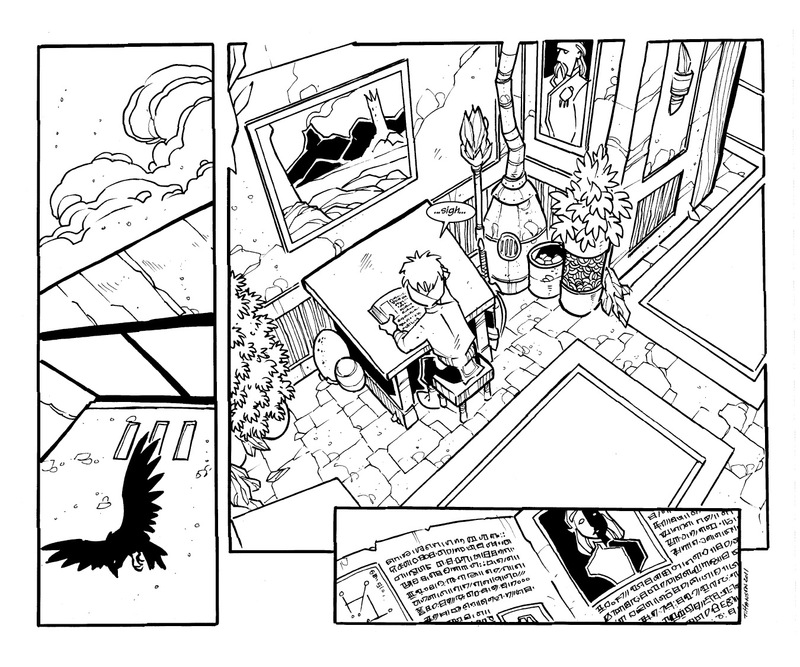 I think it's so neat the way you vary perspective with your pages. This one is particularly sharp and clear. I can almost see the warm sunlight falling across the floor. well, if he doesn't learn the history, how can he keep from repeating the same mistakes. Boring as it may be, learning the history of the sword will likely help him in the future. even the learned still make the same mistakes, don't they? one must remember books were never the high point of the bean's daily routine. So he might enjoy them a little – he is unaccustomed to studying long periods at a time. Though if he paid attention just a little more – he might find something that could help. It's time for — homework. The Bean is just a kid. He doesn't really want to be a savior, but he's trapped and now — to add to the burden — he has to study up on what's happening. No one likes having to sit inside, studying on a beautiful day. Of course most people do not have to save the world either.